-RomanticAsheville has published its 2017 fall foliage color guide. The guide offers great information about how the fall leaf color generally progresses in the mountains of Western North Carolina. In another month or so, look for more specific predictions of how this year’s fall leaf season will play out. Here’s Appalachian State’s general fall leaf color map. -Spoon, the craft cocktail bar sister to the acclaimed Knife & Fork restaurant in Spruce Pine, has closed. Chef-owner Nate Allen announced the closure via Instagram. Spoon opened in 2014. -A crowdfunding effort to establish a scholarship fund in honor of Asheville musician Jeff Knorr is seeking $10,000 in contributions. Knorr, a pillar of the local music scene, died recently. -Asheville police are still searching for suspects following the Sunday shooting death of 28-year-old Lavar Ahkeem Bailey at Pisgah View Apartments in West Asheville, the Asheville Citizen-Times reports. 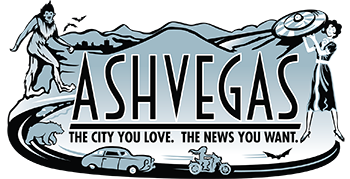 It’s the second shooting death at Pisgah View Apartments this year, the newspaper reports. -The widened Interstate 26 through West Asheville should be 6 lanes, not 8, the Asheville Citizen-Times reports. -Asheville’s bear population has learned how to open car doors. -Elise Olson, the owner of the custom undergarment and lingerie shop On the Inside here in town, has announced that she purchased the building at 842 Haywood Road in West Asheville. On The Inside is opening up retail location, a lingerie boutique, featuring Olson’s work as well as the work of other ethically-made lingerie brands, Olson says. Look for a fall grand opening. The six featured brews are a focus on small production, which means that every brew is new and exciting. The proximity to numerous Madison County farms will allow for regular, seasonal farm-style offerings. Expect many small-batch offerings as well as new releases planned every Friday. Our Head brewer, Ian Yancich has been commercially brewing over the past two years since calling the mountains home in 2011. Our beer is brewed and sold at Mad Co Brewing only, at this time. -Penland School of Crafts will host an auction of student and instructor work at 8 p.m. on Monday, Aug. 7 at the Flex Studio on the Penland campus in Mitchell County, according to a press release. The auction will feature student and instructor work in clay, glass, metals, wood, textiles, printmaking, book arts, and other media. No admission charged. For directions and a map visit www.penland.org. For more information, call 828-765-2359. All proceeds benefit Penland’s scholarship programs.